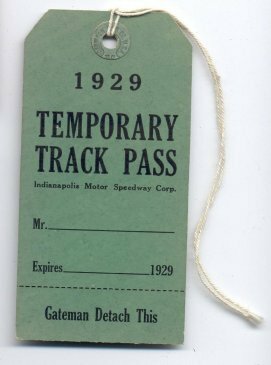 Since the Speedways opening in 1909, credentials have been issued to separate fan from driver, worker from mechanic and so on. 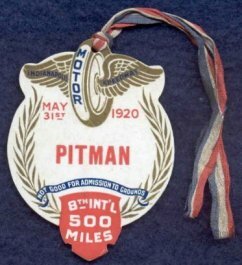 Pit Badges are a separate type of credential and arm bands could also be considered a credential but, each are covered under their own pages so this section will concentrate on other types of credentials from 1909 to 1946. 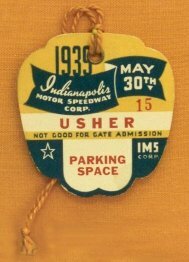 Credentials can be broken down into four main categories: Race Day Official, Secondary Race Day (Usher, Inspector, etc.) 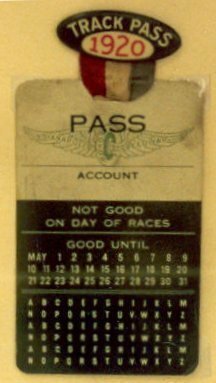 Season Track Pass, and Temporary Track Pass. Examples are shown below. 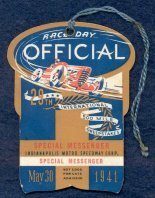 Construction of credentials consists of several different types as well: Celluloid, Celluloid Pin Back Button, Celluloid Pin Back, Button, Cardboard/Pasteboard, Thin Cardboard, Medium to Heavy Paper Ribbon and Silk Ribbon. Examples are shown below. 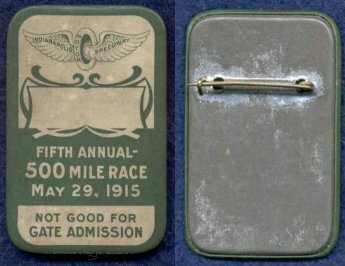 As many pre-1932 credentials are rare and very hard to find, especially those from before World War One, not all varieties and types are accounted for at this time. Where possible, a representation will be given from each year.